On Elise's birthday we told her we would take her out to eat where ever she wanted to go. However, Samantha had some friends in a play at the middle school and told Elise that her "gift" to her would be to take her "back stage" to meet the cast. Elise opted for the play instead of dinner. It was actually very sweet. I think Elise felt like a cool big kid and Samantha I think enjoyed playing the big sister roll as I dropped them off at the middle school to watch the play together. Kindof like a sisters night out. It was very sweet. So, it wasn't until this last Friday that we were able to take Elise out to El Rodeo for her birthday dinner. She was dead serious about us NOT telling the staff it was her birthday and doing the big guy with the guitar, and the singing. 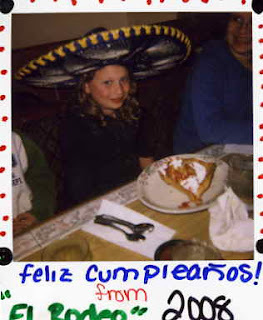 But... we fooled her :-) As you can see on her face she was a little reluctant to accept the happy wishes and birthday sombrero. Too cute! The whole restaurant birthday scene is a little embarrassing but she should be proud. One year old and wiser...even with a big sombrero! Good sport. Sounds like this birthday was one of her best. Happy Birthday again, Elise! Tracey did you guys go to Ben & Jerry's today? Heads up: Baskin Robbins is doing it again tomorrow! I tried to go to Baskin Robbins, but the line was out the door and about a block down the sidewalk! So we ended up eating generic Neapolitan from our freezer. Thanks for the tip, though. We went in Spokane last year, and it was crowded, but the line fit inside the store! Love the big sister thing. Kids have such cool moments! Elise I'm with you on the not telling it's my birthday. I'd rather just pretend it didn't happen and not because of getting older, just because! Looks like fun!! Did you have a good time Elise? ?